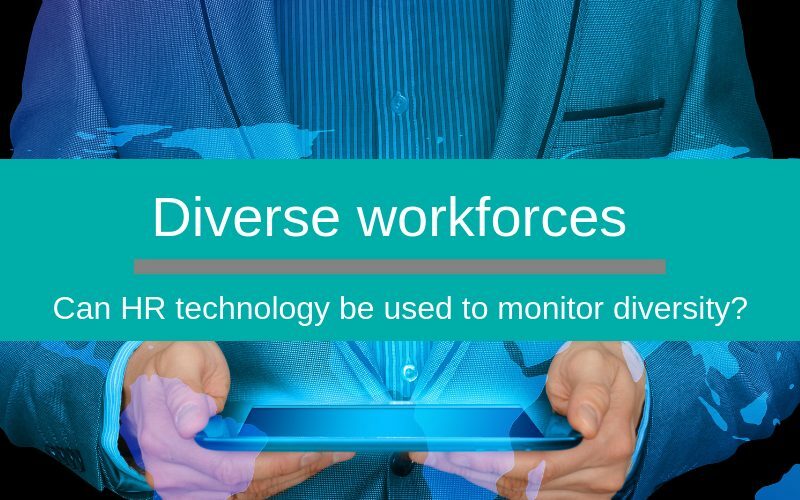 Home » News and Insights » Can HR tech create a truly diverse workforce? A diverse workforce can improve employee wellbeing, culture and help cultivate original ideas. It enables businesses to reach out to a wider pool of suitable employees. It can even bring a significant boost in productivity and with it, a good ROI. However, while many organisations understand the importance of being an inclusive employer, many find it a challenge to remove bias from their talent selection processes. Research from the Equality and Human Rights Commission (EHRC) published on 30 August 2018 makes this clear. The EHRC found that whilst a majority (77%) of employers say that ensuring workforce diversity is a priority, only 3% analyse this data to explore differences in pay and progression between different ethnicities and disabled and non-disabled employees. This is one of the reasons behind the EHRC’s push to make it a legal requirement by April 2020 for employers of over 250 employees to monitor and report on ethnicity and disability in recruitment, retention and progression. Not only this, they should publish a narrative and action plan alongside their data explaining why pay gaps are present and what they will do to close them. Whilst it’s irrefutable that it’s hugely beneficial for businesses to collect diversity data, I think we’re still a long way off ‘what gets measured gets done’. The problem is that simply recognising the problem is far from enough to solve it. We just need to look at the introduction of the Gender Pay Gap reporting to realise that monitoring is just one element. In an increasingly globalised, hyper-connected world of work, diversity and inclusion (D&I) are key drivers of employee acquisition, engagement and productivity. If businesses can see the wider benefits of collecting diversity data and use it as an opportunity to create a fairer, more inclusive working culture, they’ll also reap the benefits in terms of ROI. It appears to be not just a dance, but a flash-mob! LinkedIn’s global recruiting trends 2018 report found 78% of talent leaders are tackling the hiring of diverse talent head on. Why? To improve culture and boost their organisation’s financial performance. According to research from a McKinsey study, organisations that are gender-diverse are 15% more likely to outperform the competition; whilst ethically diverse organisations are 35% more likely. So, if you want to take a hard-line business approach, those statistics are hard to argue with. But how easy are they to achieve and what role does AI and automation play? 63% believe technology will enable them to overcome many of the socioeconomic challenges their employers’ face, and 58% believe it has the power to overcome unconscious bias. That’s a great deal of trust, so how can HR automation and artificial intelligence deliver on this and what steps do you need to take to tackle algorithmic fairness? Your organisation might already have a HR system that can predict who is going to be a good fit for the company by drawing on data from HR software. But if these systems learn from historical data, you could be at risk of hiring in the image of previous staff instead of tackling under-representation. Any bias that’s already in the data will be picked up and incorporated into something that’s systematic and maybe even accentuate existing biases. As a HR Manager, you’ll want to be sure that the path an employee takes at your organisation is not influenced by historical talent practices. You’ll also want to be as up-to-date with what your current workforce’s understanding of a fair workplace might be. After all, the very meaning of ‘diversity’ is changing. While traditional gender, race, and age diversity remain important, research suggests that ‘cognitive diversity’ is beginning to carry weight. Recent research from Deloitte’s 2018 Millennial Survey reveals a generational shift in peoples understanding of diversity. Only 17% of millennials and 24% of Gen Z respondents referred to demographics, lifestyle or faith in their understanding of what diversity means. 18 percent of millennials and 19 percent of Gen Z respondents think of ‘tolerance, inclusiveness and openness’ when deciding whether an employer is inclusive or not. The changing perception of diversity of these two generations needs to be recognised. After all, by 2025, they will make up nearly 75% of the workforce. When considering your HR software options, you’ll need to analyse whether it will be able to keep pace with your current and future workforce. There’s a broad range of cloud-based solutions available. For instance, SAP SuccessFactors provides HR managers with the insight they need to counteract bias. For example, intuitive language indicators filter out biased wording in job descriptions and even in performance feedback. This can provide much needed insight into how managers use language to inform hiring or promotion decisions. It diverts attention away from focusing on a potential employee’s background, gender or ethnicity to focusing on skills. We’re also seeing the emergence of software providers using behavioural neuroscience and artificial intelligence to remove bias from the recruitment process. Pymetrics, for example, bypasses the CV, and uses data generated from brain games to match applicants with roles. Whilst Mya Systems, which is designed to integrate into existing HR systems, uses a chatbot ‘Mya’ to make initial contact with candidates. Mya is programmed to ask objective performance related questions so as to avoid unconscious bias. There’s also a move towards data-driven AI video interviewing software solutions. For example, HireVue, can analyse video interviews and filter candidates based on dynamic questioning and event voice and face recognition. There’s no doubt, new developments in HR technology are impressive. However, you’ve got to remember there are internal and external factors to consider when deciding what’s going to work best for your organisation. Another thing to consider is that legislation is still playing catch-up with HR automation – meaning regulating its effects can be complicated, especially if you are looking for a system that is fit for global expansion. Austria and Germany, for example, have some of the strictest laws around decision-taking algorithms. In the UK, some protections are already in place with organisations having to disclose if a decision was made entirely by a machine, and if so, it can be challenged. This means, as a HR Manager, you’ll want to be cautious with how technology is introduced. Being transparent about what you want your HR software to do and where it draws data from to help your team make recommendations, will be key. As I mentioned in a recent blog examining the role of AI and automation in talent acquisition, technology is extremely promising, but it’s not a replacement for the ‘human’ in HR. Certainly, AI and automation, can be fantastic equalizers, quashing conscious and unconscious bias. As of yet though, technology is not infallible as it can’t always understand context. It can help HR managers see which areas of their business need fine-tuning to encourage diversity. And since HR systems are rule-driven, it’s easier to identify when technology is recommending discriminatory actions versus when a human does it. But HR managers cannot rely purely on the ability of vendors to create a diverse and inclusive working environment. It is still humans who will realise its impact. But when they do, the benefits for the organisation are plentiful.